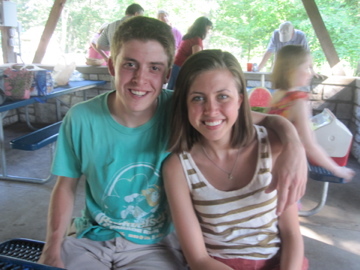 BUT the picnic wasn’t until the afternoon, so there was Church, grocery shopping, and breakfast to be had first! 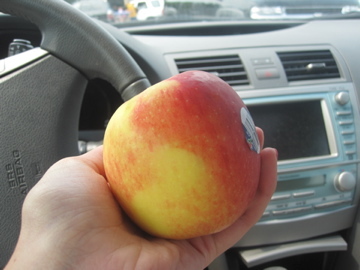 I got pretty hungry while at the store so I snacked on a crisp apple on the way home. The main course was something I don’t eat often – cereal. 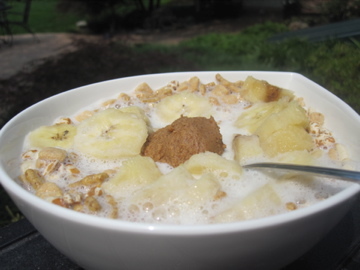 Usually a bowl of cereal won’t fill me up, so I added a banana and a scoop of almond butter to my Kashi Go Lean today. I then spent some time listening to IIN modules and snacking on melon and tortilla chips. When my Dad got home we decided to head to the bike store before the picnic. 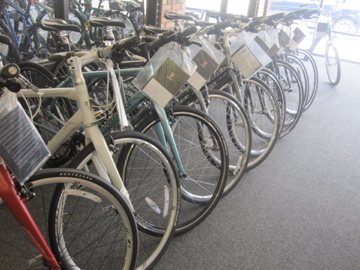 He still has to pick out his bike from Christmas, and I’m now in the market because I’m considering triathlons! 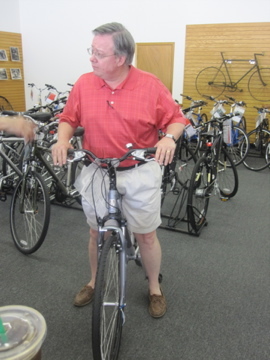 My dad is going to get a slightly more recreational bike because he wants to start biking with my mom. I hope my mom’s down with that. Then it was Family Picnic time! 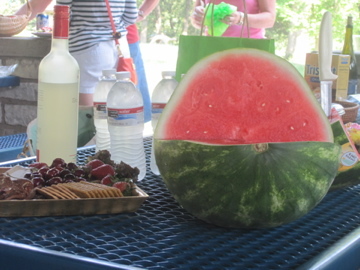 It’s held at a local park each year and everyone brings their own food and snacks. And I swear each year there is a new baby or a recent wedding that I didn’t know about. Always fun to meet to members. And Bingo… Bingo is the main event and I WON last year. No such luck this year…it was an off day. And birthdays! 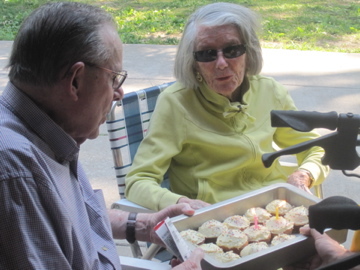 Two of the “Super Six” (the original six brothers and sisters that started the Brady Family) were born on the same day and we always celebrate at the picnic. Great Uncle Jack and Great Aunt Ginny are two of only three surviving Super Six members. My grandfather is one, but he passed away about 13 years ago. 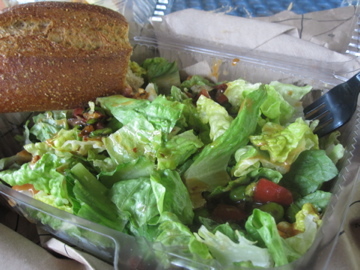 For our meals we brought Bread Co. (Panera). Lots of my family brings KFC which I find hilarious. I had the Thai Chicken Salad – no chicken and no wonton strips. I also dug into a big slice of watermelon and tried a sip of Skinny Girl Margarita! We didn’t end up getting it last night and I was so excited to see one of my family members brought a bottle. It was definitely more sour than a regular margarita, but I love that about it. Sweet drinks aren’t my thing. I’d drink it again. Around 5:30 things were starting to wrap up so we said our goodbyes and hit the road. My brother drove me home on the way to his THREE softball games tonight. He also had a soccer game at 9 am this morning. He’s insane. Very happy to have a low-key Sunday night to relax and get ready for another work week. And I think I just saw that the Next Food Network Star starts again tonight? Don’t mind if I do…. 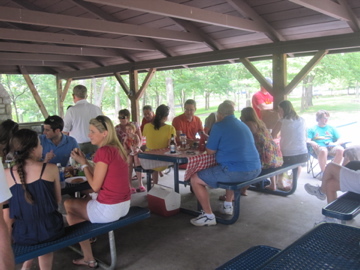 Does your family have a picnic or reunion? My immediate family is pretty small – only two living first cousins both on my mom’s side. But my extended family on my Dad’s side is pretty big! That is SO exciting that you’re considering triathlons! Good luck finding a bike! We don’t have reunions or picnics, just general get-togethers! My family is pretty small, so our get-togethers usually involve the same people- my parents, a few aunts and uncles, a few cousins, a few cousin’s babies! Since moving out of state, it’s especially nice to be able to attend these family get-togethers when I’m home during summer vacation! Looks like a fun family picnic! We don’t do anything like this! You are making me want to plan a little shindig for my fam! Your family picnic looks fun! My family is super spread out (on my dads side) but I side my moms side all the time (probably cause it consists of like 4 other people haha). Sometimes I wish I had a hue family with lots of close cousins, ohhhh well. I’ve been thinking about tris too. Sprint. Maybe even super sprint. My mom just got a family membership at the gym at home that has a great pool….we shall see! Family picnics are always so much fun! Glad you had a great time. 🙂 LOVE bingo at these things. 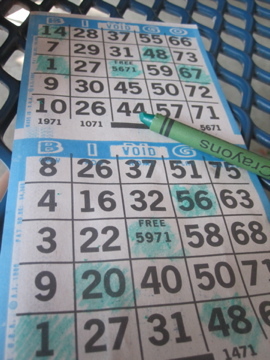 We used to play bingo at our family picnics too. As an Irish girl living in Ireland I have a big extended family. We tend to mainly meet up at weddings or funerals, rather than organised meetups. As for my immediate family I’m an only child and only have 8 first cousins but I’m reply close to them all, and to my second cousins once removed. ThAt looks so much fun though. I love how you all bring your own food. I love family events as an adult a lot more than when I was younger. My dad’s side of the family has a family reunion pretty much every year or two. He has six siblings and all of the his siblings have at least three kids so it is definitely a pretty big family. On my step mom’s side of the family we have get togethers for everything it seems like. Birthdays, holidays, you name it. She has five siblings and they each have at least three kids as well. I’m excited for the Next Food Network Star as well! 🙂 Hopefully there are some good competitors. It seems like every year there is someone who is interested in more of a healthy lifestyle that doesn’t get to the end. Hopefully that will change this year! that sounds like such a fun family picnic! 🙂 my family doesn’t do anything like that, but i have a huge family on my mom’s side. my mom has 6 siblings, i have 13 first cousins, almost all of us are in relationships, and some of the cousins have kids now too, so it’s always a big group when we get together, which we do often! i love it. Fun pictures! My mom has 7 brothers, so that is big in itself. That entire side of the family has a reunion once every 4 years and there are about 250 of us..Woah! Sounds like a great time! Traithlons look like a whole lot of fun… Have to start saving your pennies so you can get that bike! 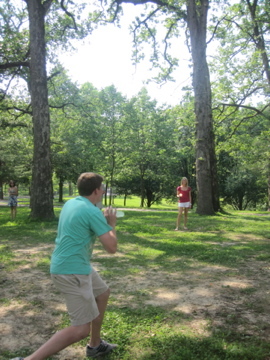 Your picnic/reunion looks like so much fun! Makes me wish I had a bigger family.